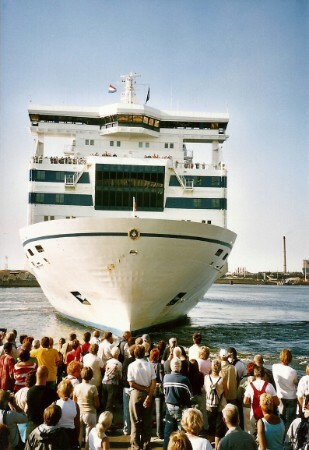 Queen Of Scandinavia was an extra attraction for the IJmuiden harbour festival when she departed during the 2005 festival. The quay's were crowded with people when she sailed. At the end of the 1970's, the biggest passengerships that were ordered were not cruiseliners. Even according to Cunard Line officials, there would be no cruiseships built anymore. The biggest ones were ferries and when at the 25th of july 1980 Finska Angfartygs (EFFOA)'s Finlandia was launched, her measurement of 25.678 tons made her the largest ferry in the world. By far, because all other ferries in the world did not even come close to the 20.000 ton at all. In comparissement, the largest cruiseliner and the first of these ships to be launched in three years time, was Carnival's Tropicale with a measurement of just under 23.000 tons. Finlandia was originally planned to be named Skandia, but this was altered during building. She had a lenght of 166,10 meters and was 29,04 meters wide. She had accomodations for 1601 passengers in 640 cabins, as well as 399 passengers on comfortable deckchairs. Her crewnumber was 164 and next to this, on her cardecks some 1044 meters were available to sail with 480 passengercars. The ship was equipped with four 12-cylinder diesel engines, driving two screws giving hr a normal cruising speed of around 22 knots. The ship was launched from the famous Wärtsilä yards at Turku in Finland under yardnumber 1251 and was delivered at the 30th of march 1981. Also at this day, the ship was named by Tellervo Koivisto, the wife of President-candidate Mauno Henrik Koivisto at Turku. Although the ship was owned by Finska Angfartygs, because this company was part of the Silja Line consortium, she was painted in Silja Line colours and served on their most important Helsinki-Stockholm route. The homeport of the ship was Helsinki. With her introduction, Silja Line tried to change the nature of the normal ferry-route by making the ship into a ferry offering cruise-ship standards. So maybe you can say that this was the very first cruiseferry in the world and also you can try and say that the Finlandia maybe was the biggest cruiseliner built in these years. A second ship, an exact sister to Finlandia, was the Silvia Regina and she was owned by another company within the Silja-group, Svea Line. This ship also sailed the Helsinki-Stockholm route from june 1981 onwards. In the naming, clearly visable is the structure of the Silja Line at that time. Although all ships used the colours and marketing of Silja Line, they were all owned by different companies. In fact, Silvia Regina was originally planned to become the first ship in the fleet to have the 'Silja'-prefix. She was planned to become Silja Star during building. Originally, the ships had been designed with a very 'fat' looking bow, so a maximum amount of cars could be ferried. Downside was, that especially in the harsh Scandinavian winters, the fat ships were very difficult to manouver, so after just eight months in service, the ship's bow was rebuilt at the Wärtsilä yard at Perno in january 1982. This gave her a new, sleek look and a small increase of tonnage to 25.905. At the first of november 1982, the Finlandia collided with the Finnish trawler Julanta, but there was more damage done to the Julanta then the Finlandia. Size does matter, I suppose... The ship was used for two special cruises during 1984, on the 19th of may 1984 a special cruise was organized for Wärtsilä workers to celebrate the 150th anniversary of the wharf and a few days later she made another cruise to celebrate the wharf's anniversary at the 23rd of may, but now for specially invited guests, including the Koivisto-pair. The now President of Finland and his wife always had an affectionate bond with the ship, they also used her for an official visit to Sweden in 1985. Also in 1985, the ship's interiours were largely rebuilt at the Helsinki shipyard of Wärtsilä. Queen Of Scandinavia just departed her IJmuiden berth sailing for Newcastle at the 29th of june, 2003. Silja Line were not done introducing large ferries for their most profitable route, as they introduced two giant ferries again to replace the former giants in 1990. Of course, they could not do less then again building ships that were as large as the cruiseships around that time, Silja Serenade and Silja Symphony were measured at 58.000 tons. Again, these were the largest ferries in the world, now truly owned by Silja Line instead by the different companies. The consortium had becoma a true merger between the seperate lines dusing the 1980's. But the introduction of these new ships was not without problems, as the funds for their building were obtained by selling the Finlandia to a company named Suomen Yritysraohitus in september 1988. When the new ships were introduced, SY would sell the ship to another company, DFDS of Denmark, but in the meantime, the ship would be chartered to EFFOA untill the delivery date of the Silja Serenade. This date had been set at may 1990. The problem arose, when the shipbuilding division of Wärtsilä, where the new ship was built, was declared bankrupt at the end of 1989 and all work had been suspended. 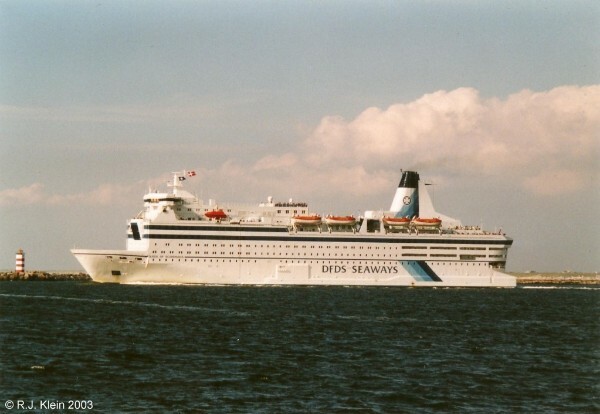 Because DFDS had the arrangement, the ship was sold to them at the 11th of may 1990 and got her new homeport of Copenhagen as well as a new name Queen Of Scandinavia. 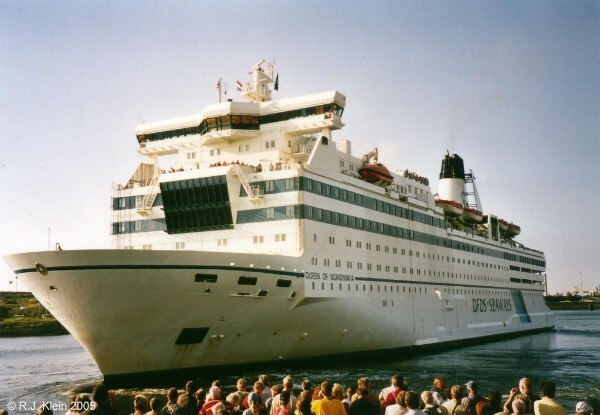 Silja Line now had to find a replacement ship for the continuation of the service, untill Silja Serenade finally arrived and sailed at the 18th of november 1990. From the 1st of june 1990 onwards, the Queen Of Scandinavia was sailing the route between Copenhagen, Helsingborg and Oslo. She was paired to the King Of Scandinavia, which was the former Wellamo of EFFOA, the ship that Finlandia replaced in 1981. In 1995, the ship was slightly rebuilt with seven extra cabins, so now 1666 passengers could book a cabin and 334 passengers had to sleep at the same number of deckchairs. Her tonnage-measurement changed to 33.575, also. Between january and march of the year 2000, the ship was again sent for a rebuilding, this time her bow and stern were rebuilt and this rebuilding again increased her tonnage, it was now measured at 34.093. The most striking difference was that the ship lost her forward loading door, so now cars could only enter through her backside. Her bow had also become more sleek and at the back she had recieved a ducktail. 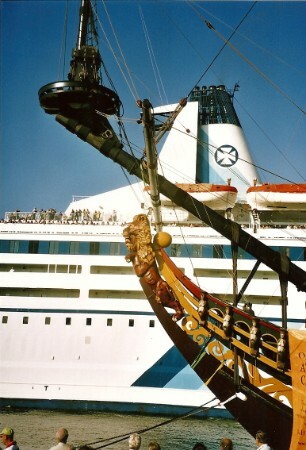 An historicly totally incorrect picture, as Queen Of Scandinavia passes the Prins Willim VOC replica-ship during the IJmuiden harbour festival in 2005. Sadly, Prins Willim burned a few years later. Queen Of Scandinavia showing off her bow to the visitors of the same festival. The large two-deck high windows offer great sea-views from the ship's restaurant. 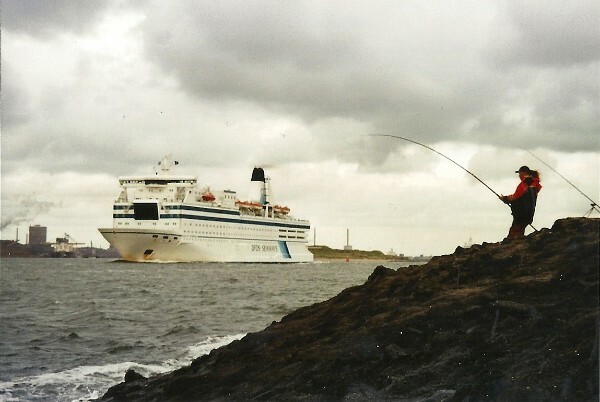 One of the most profitable route's of DFDS in the late 1990's was the route between IJmuiden and Newcastle and the passengernumbers steadily increased over the years since it's re-opening in 1993. In 2001, the older and smaller ships on this route were to be replaced by larger ones to cope with the growing traffic and DFDS decided to place the Queen Of Scandinavia on this service. During her Northsea sevice, an incident occured in september 2002, when a woman was reported falling overboard from one of her upper decks in the early morning. The Yarmouth coastguard assisted the ship in the search and later carried on alone when Queen Of Scandinavia followed her route towards IJmuiden with a seven-hour delay. In 2006, DFDS took over the route between Newcastle, Stavanger, Haugesund and Bergen from the bankrupt Fjord Line, a company from Norway. With the route, the Princess Of Norway came also under DFDS management and this was the sistership to the King Of Scandinavia ''The IIIrd' that already sailed the IJmuiden to Newcastle route for DFDS, together with his Queen Of Scandinavia. Because DFDS now was capable of operating the IJmuiden to Newcastle route with two sisterships, the Queen Of Scandinavia and the Princess Of Norway swapped route's from may 2007 onwards. The names of the ships were not changed because of this move. At the 26th of november of 2007, Queen Of Scandinavia did come into a little trouble when her moorings broke while she was docked at Bergen, Norway. She drifted and collided with the expedition vessel H.U. Sverdrup II. The Queen did not suffer that much damage and could operate her normal sailing scedule, but the expeditionship was badly damaged. I guess, size still matters. The route was also no succes under DFDS management, and it proved that it was not without reason that Fjord Line was declared bankrupt. The route only made losses, also to DFDS, so at the 1st of september of 2008, the route was closed down. Because there was no route available to the Queen Of Scandinavia, the ship was laid-up at Korsor, awaiting charter or sale. This fisherman from IJmuiden seems to have the catch of the day, maybe even the catch of the week. The day is the 11th of june 2005. She was chartered to Alstrom from february 2009 onwards, for the housing of 800 workers for the upgrading of the 3rd reactor of Oskarshamn's nuclear power plant. On the 16th of april of that year, a fire broke out in her engine room, while she had 238 people on board. They were all savely evacuated, but the ship suffered considerable damage to her auxiliary engines.At the 12th of may 2009, DFDS managed to sell the ship to a company based in Finland and named Nordic Sea Line, that was not a sea line at all. It was supposed to use the ship as a floating hotel and conference centre in northern Europe. But because Nordic Sea Line was not able to make payments, the scene was cancelled. When her service as an accomodation ship in Oskarshamn ended, the ship was moved to the port of Klaipeda in Lithuania, where she was laid-up. In december 2009, she briefly returned to Copenhagen, Denmark, chartered by the Danish police as a hotelship for the environmental conventions. From april 2010 onwards, the ship finally recieved a new home, as she had been chartered to Cruise & Ferry Lt., trading as the St. Peter Line for a new service between St.-Peterburg and Helsinki. For this, the ship was renamed Princess Maria and she sailed her first crossing starting the 21st of april. The ship was now registered at Malta, her homeport being Valetta. St. Peter Line is part of DFDS, marketed by the DFDS LISCO, that is the Lithuanian Shipping Company.